Happy weekend, y'all! Now that Halloween is over, we skip over Thanksgiving and get right into the holidays, right? That's what it seems like every year. 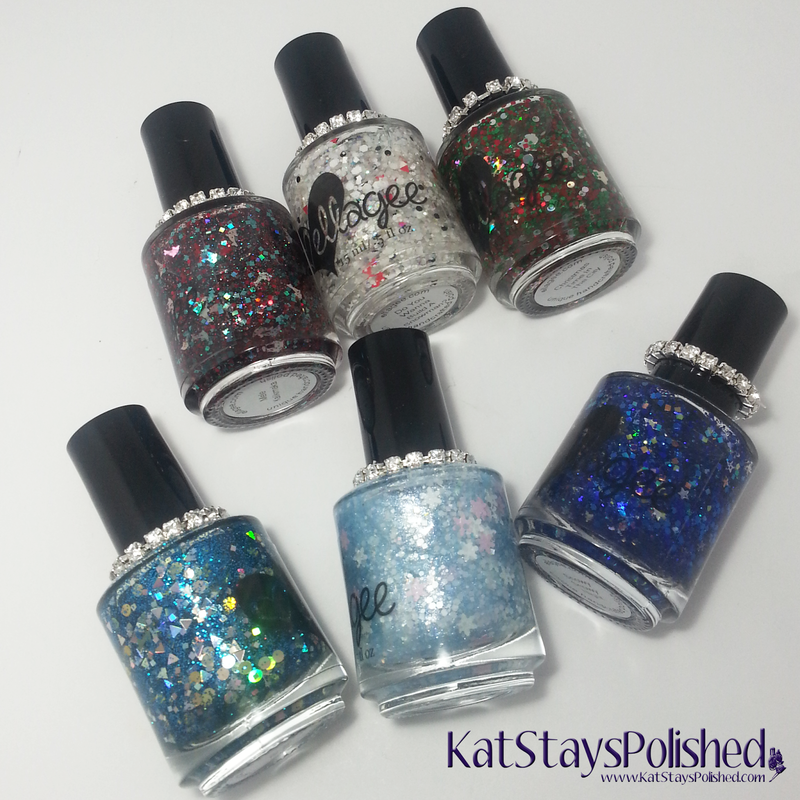 I don't mind it too much, especially when I have glittery themed polishes in hand, like these new ones from ellagee! Pre-orders for these polishes are taking place now and this set will be available through December 31, 2014. Let's take a look! Christmas Time in the City over Zoya Hunter: a clear base with red and green glitters in various shapes and sizes and silver holo dots and bells. I really love a good red and green polish for Christmas. This glitter mix is so festive and I love that each bottle comes with a pack of Christmas Tree glitter to do nail art with. All the fingers (except the accent) have just 1 layer of Christmas Time in the City and topped with ellagee Glass Top Coat. 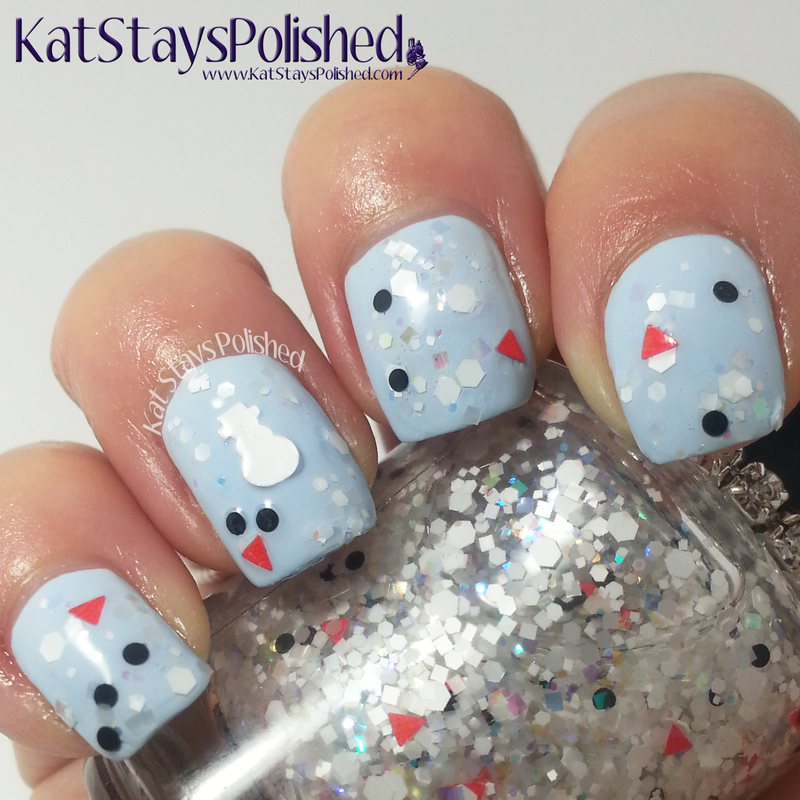 Do You Wanna Build a Snowman over Zoya Blu: a clear base with a mix of white, frost white, and iridescent glitters with just a bit of black dots and orange triangles. Okay, this has got to be one of the cutest glitter mixes on Earth! It has all the elements of what would be on a snowman! Each bottle if this comes with a pack of white snowman glitters. You can REALLY build your own snowman! Again, 1 layer of DYWBaS and topped with Glass. Baby It's Cold Outside over Zoya Blu: a shimmery sheer base with white, pink, blue, and iridescent glitters in various shapes and sizes and pink and white snowflakes. This is such a lovely, frosty, shimmery polish. I love all the snowflakes throughout. Each bottle comes with a pack of bigger sized snowflake glitter to play around with. Mele Kalikimaka over Zoya Neve: a clear base with an island flavored mix of turquoise, emerald, and red holo glitters with silver holo dolphins. I love how fun this polish is. Do you see the dolphins? 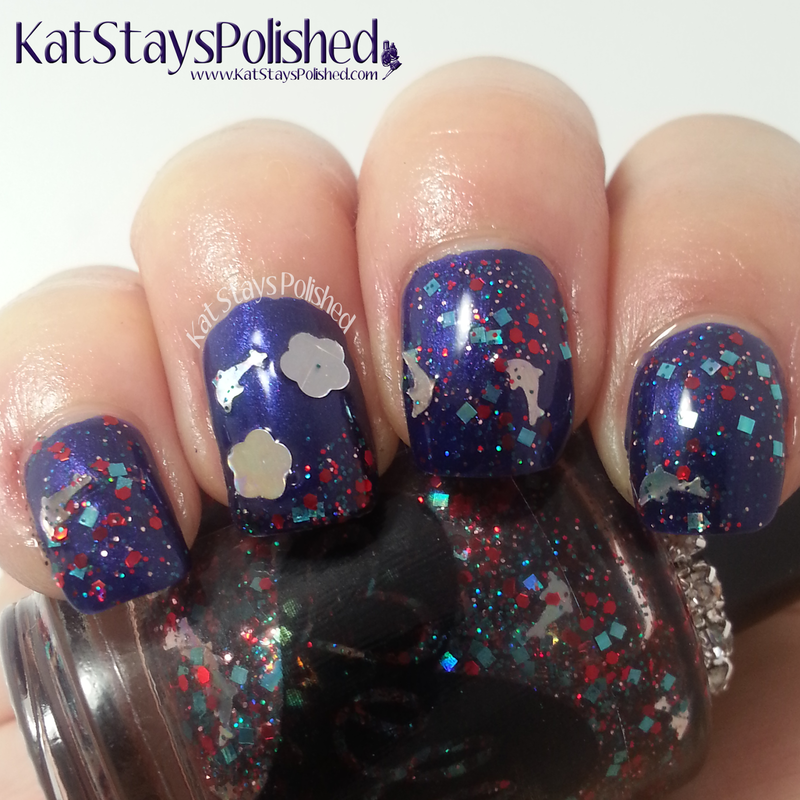 This polish is super dense with glitter so you only need one coat to cover your nail. Each bottle comes with a pack of silver holo flowers for nail art. 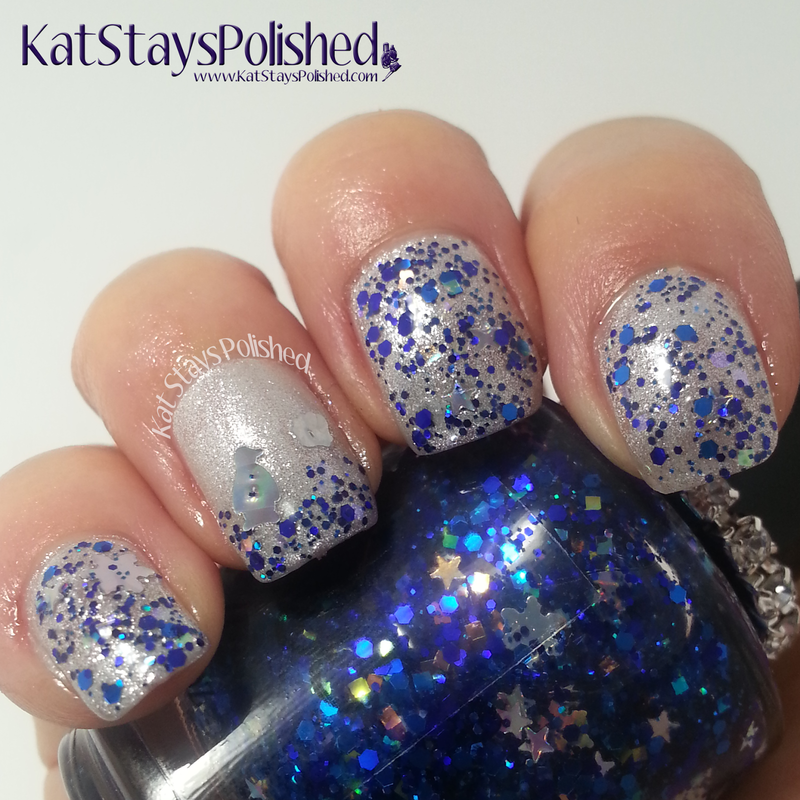 Snowy Snowy Night over Zoya Seraphina: a clear base with rainbow iridescent glitters and silver holo stars and snowflakes in a mix of blue glitters. I am in love with a blue-silver combination. I just think it's so pretty and definitely reminds me of winter. This densely packed glitter is super pretty, especially with the random sliver stars all throughout. Each bottle comes with cute little penguins to play with. See the little guy on my ring finger? 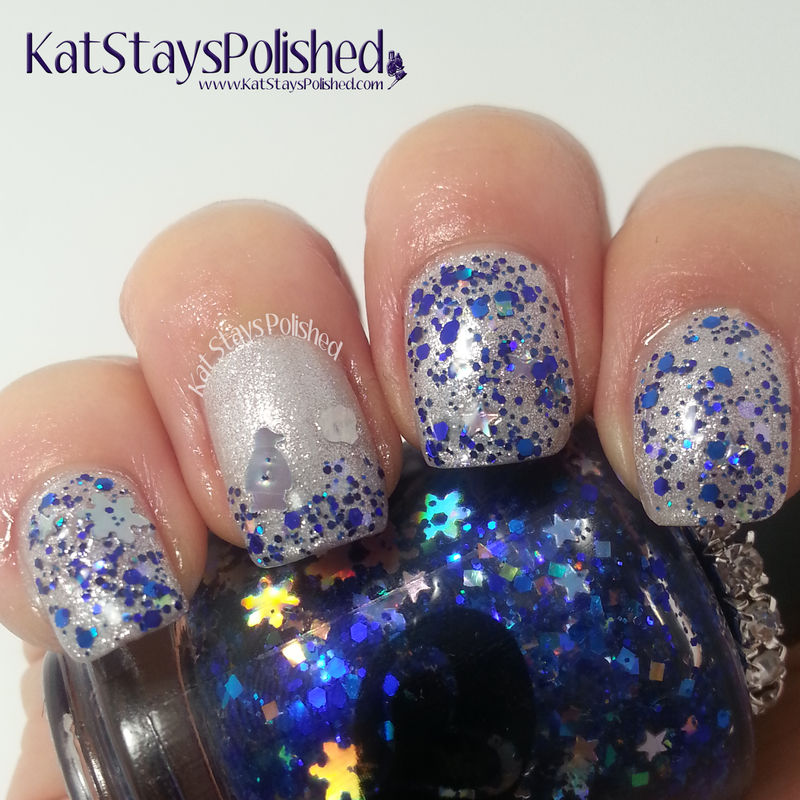 Chanukah Gifts over Zoya Seraphina: a clear base with tiny bright blue metallic glitter with silver holo squares and triangles and gold holo dots to represent the traditional dreidels and gelt. This one combines blue, silver, and gold glitters to beautifully represent the tradition of Chanukah. Each bottle comes with white bow glitters to play with. I just used them for a simple accent nail. Are you into glitter polishes? I just think that there are so many different combinations of glitters now, especially with shaped glitters, that you can create almost any look you want. Be sure to head to the ellagee shop and place your pre-orders! The set is $45 but only during the pre-order period from Nov 1-7. The shop will be taking orders from now until the end of the year. December 1-18, the shop will be open but shipping will be on pause until after that period.